Your property is defined by property boundaries and the position of your home, but within those boundaries, it's possible to create interesting divisions of space or to open up the space for grander views. Families with active children may want open yards for playing soccer, but a gardener may want a series of smaller well-defined spaces. It's important to keep space in mind when designing a landscape. A generic landscape filled with generic plants won't offer much interest, but a well-designed custom landscape will reflect your personality. By choosing your favorite native plants, you'll feel that your landscaping is a reflection of you and your family. Native plants require less maintenance over time than plants imported from different climates, so it's wise to stick with what feels most at home here in the Cleveland area. Pools and spas. 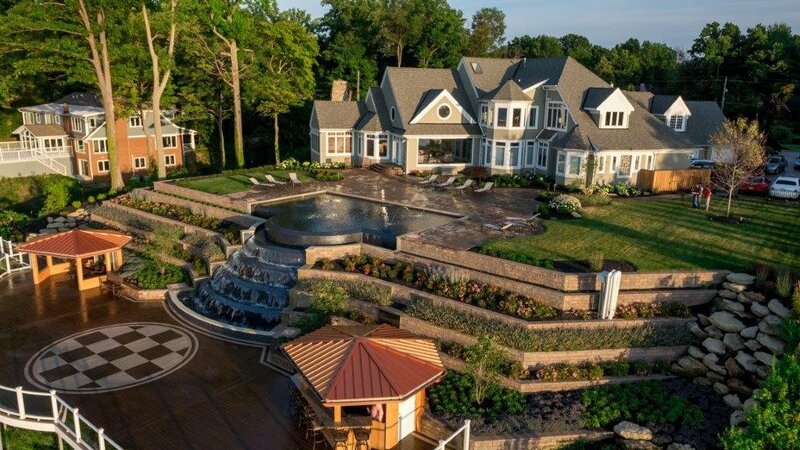 Here at Green Impressions, we know how much a beautiful pool or spa can do for a landscape. Not only do pools and spas add visual interest, but they provide endless hours of entertainment and relaxation. Patios. Forget the old rectangular concrete slab patios. Today's patios are unique and beautiful, and they can play key roles in your landscaping. Patios can turn an awkward area of your property into a place to relax, share a meal, or spend time with your loved ones. Outdoor Fire Features. If you're a camper at heart, an outdoor fire feature can turn a dull evening into a spur-of-the-moment marshmallow roast. Consider both fireplaces and fire pits. Outdoor Dining Areas. Take full advantage of warm weather by eating outdoors. A well-designed outdoor dining area allows you to entertain more easily or to enjoy a quiet, private breakfast on a gorgeous summer morning. Playgrounds. Children love to entertain just as much as anyone--maybe even more. With a Green Impressions playground area, your kids can host their friends right in your own backyard. Outdoor Kitchen. An outdoor kitchen offers refrigeration, cooking elements, storage, and anything else you rely on as you prepare meals. 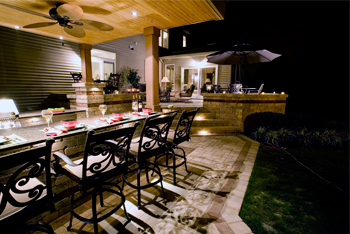 When you have an outdoor kitchen, you don't have to shuttle food and supplies in and out of the house during a party. Outdoor Bar. Like an outdoor kitchen, an outdoor bar offers you all the amenities of an indoor bar without having to set up temporary equipment each time you entertain. Retaining Walls. Well-placed retaining walls separate areas of your landscaping and can even perform important functions when they include built-in seating or lighting. Pergolas and gazebos provide shade, height, and structure to your landscaping. Don't overlook the lifestyle-enhancing potential of landscaping structures. A beautifully designed landscaping plan produced by Green Impressions improves your lifestyle, taking your habits, hobbies, and personality into consideration. For more information about your custom landscaping design, contact us at Green Impressions.